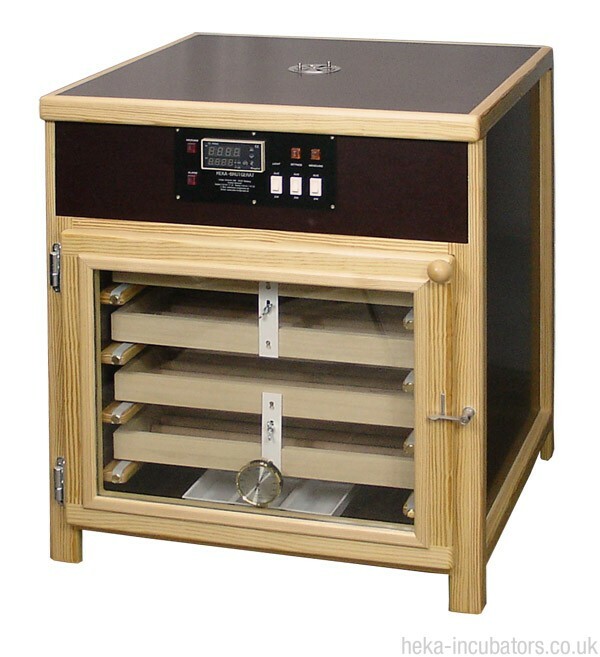 Wooden Incubator with Automatic Turning, Digital Temperature Control, Automatic Cooling. Manual Humidity Control. *Would you like a Hatching Basket for shelf 1? *Would you like a Hatching Basket for shelf 2? *Would you like a Hatching Basket for shelf 3? *Would you like a Hatching Basket for shelf 4? The HEKA Standard 7 has four incubating trays, which are larger than the HEKA Standard 6, giving a total capacity of approximately 400 chicken eggs. It is supplied with your choice of incubating trays (to suit a variety of egg types) and you can purchase hatching baskets if you also want to use it for hatching. For batch incubating, all incubating trays can be swapped for (optional extra) hatching baskets, and the egg-turning function should be manually switched off. For cycle incubating, the lower tray can be swapped for the (optional extra) hatching basket to use the lower section for hatching, while younger eggs are still incubating above. The automatic egg turning for the lower tray should be manually disconnected in this case.